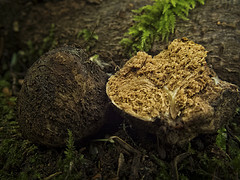 Truffles are a type of fungus that is usually found around trees. They need water, air and a close proximity to trees if they are meant to thrive. Truffles are edible. However, because they are difficult to grow, they can be sold at extremely high prices. If you want to find truffles on your own, go with your dog. Dogs know where to pick up truffle scents. Once you find these mushrooms, pull them out from the ground, clean them up and prepare them properly for cooking. Truffles have a unique flavor when you add them to a variety of dishes. Many restaurants opt for truffle oil to do their cooking which can be obtained from most supermarkets. However, with the growing number of truffle cuisines on the market, it has now become important to prepare for any allergic episode. A truffle allergy ranges from the mild to the severe. It may come down to a little discomfort or be a severe case of vomiting, breathing difficulties or even death. If you are allergic to truffles and eat outside most times, ensure you always carry Epi-Pen for any emergencies that might occur. If you always attending family get-togethers, it is important to always go to gatherings where you bring your own food. That way you know what you are eating and would not mistakenly slip a mushroom in between your teeth and start to convulse. Some people are allergic to truffles and are not even aware of this fact. Truffles are not popular in some places because they are not exactly eaten alone. But you need to take extra precautions because they are used to garnish a variety of dishes. Truffle allergies are usually characterized with redness of the skin especially around the face and throat areas. They also cause stomach pain, hives and itchiness. If you are undergoing a serious attack, unconsciousness, numbness, breathing difficulties and seizures may set in. There is a good chance that you might react to truffles if you have a history of other food allergies. If you want to be sure if you would react to truffles, try a little sample and see how your body reacts. If your body does react, use antihistamines immediately. Antihistamines are used to stop allergic reactions and curb symptoms. However they do not work, if you eat truffles in sizable portions. Any time, you exhibit truffle symptoms; see a doctor for extra checks and further confirmation. A doctor would provide you with the relief and medications required to get rid of all the symptoms that you are experiencing. A healthy eating plan is important for all people, regardless of your age. There are many resources that you can turn to make your own and not all plans will work for you. If you have immunity issues or allergies, you might have to visit a dietician or your doctor to get a specific plan that is tailored for your needs, which may mean avoiding certain foods that everyone else might eat. A healthy eating plan also depends on your personal tastes. If you do not like meat and adore vegetables, fruits, grains and seeds, you may well choose a vegetarian plan. If you are an athlete, you might have to eat a plan designed to increase your proteins and carbohydrates. For those who need to lower their cholesterol or avoid bad carbohydrates, you might have to have a low-carb diet. For others who have problems with high estrogen, salt intake or even gluten, specified adjustments may need to be made to ensure that the right amount of nutrients and calories are consumed to avoid malnutrition and serious complications. Generally, a healthy eating plan will include what you eat for breakfast, lunch and dinner, as well as snacks and drinks. In a regular diet, you will have to find a balance of foods from four main food groups, including meats and alternatives, dairy products, grains and seeds and vegetables and fruit. Most importantly, to ensure that your plan is healthy, you should have at least 6 to 8 glasses of water daily to allow your body to process everything and make the best use of the nutrients that you are consuming. When trying to formulate a healthy eating plan for yourself or anyone else, always consult with a doctor and/or a dietician. There are many resources provided by health organizations and government ministries/departments worldwide to help you determine your needs, including those that relate to your cultural foods. Your local health nurse usually can provide you with ample literature to ensure that your consumption is as it should be and help you determine the needs for people with special health requirements, including those for children, the elderly, infants, nursing or pregnant mothers and those with compromised immune systems. The concept of a comprehensive food nutrition guide is thought to have been the brainchild of Swedish writer Anna Britt Agnsater, first published about 1974. The American Department of Agriculture has revised and improved on it. First published in 1992, it utilised a pyramid style mnemonic in which the suggested food groups and daily quantity intake was outlined. 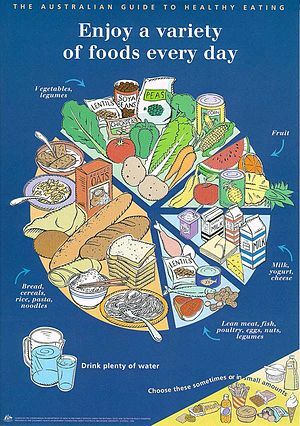 It was a visual food guide graphic that remained in use until 2011 when it was replaced with a new publication distributed by the United States Department of Agriculture (USDA) called MyPlate. Several other countries have also published their own version of nutrition based on the idea of the pyramid graphic as created by the USDA. The established food groups as outlined are the Carbohydrates, vegetables, fruits, oils, dairy and meat and beans. Vegetables provide essential minerals and vitamins and it is suggested that the average person eat about two to three meals with vegetables daily, however the balance of vitamin and mineral depends on the form of vegetable you’re eating, therefore it is important to consume a variety of vegetable to maintain this balance. Believe it or not, your balance depends on the color of the vegetable. Dark green and orange coloured vegetables have vitamin C, green vegetables have vitamin A, and you can find minerals such as calcium and iron in ruffage vegetables like broccoli. Although it is well known that vegetables have nearly no calories and extremely minimal amounts of fat, the manner by which it is cooked can alter that. Fats, the bane of many a person on a diet, is actually not all bad so long as the correct kind of fat and amount are consumed. Oils that are typically found in cooking oils or in butter products along with foods that have a high fat content are considered hazardous to your health in and of themselves and in the quantities that you consume. Some kinds of vegetable, fish, fruits and even nuts will provide a healthy dose of fats but remember that in oil, moderation must be exercised! Meats as part of the recommended food group is nutritious and known for its content of essential proteins and vitamins but it too can have measures of fat that are considered unhealthy so a balance of meat with this mental note in mind will keep fat levels at a minimum. Dairy foods too have fat content but that doesn’t mean that it should be put on the back burner in consideration either as it has vitamins A, B, C calcium and phosphorus. For adults, the recommended daily intake of these food groups range between two to three servings per day along with foods containing carbohydrates (which the body converts to glucose), fruits and meats. Everything in moderation must be eaten with the important note to remember that not all that you eat is good for you if you consume too much of it.